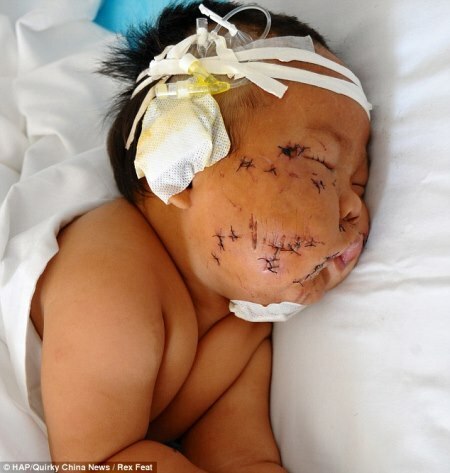 [float=left] [/float] Eight months old Xiao Bao was stabbed 90 times in the face with scissors by his mother for biting her while she was breastfeeding him. The incident that has left many people shocked happened in Xuzhou, in the eastern China Jiangsu province. After the attack, the mother disappeared leaving the infant in a pool of his blood in the yard of their home. Xiao was found by his uncle who rushed him to the hospital. The baby needed more than 100 stitches. The mother, who has since been arrested, is not known to be suffering any kind of mental illness. This is wickedness of the highest order.